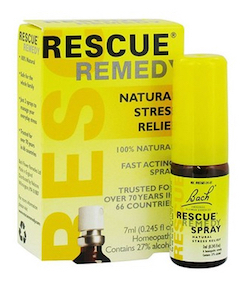 Rescue Remedy has been used successfully on stressful days where we suffer from impatience, tension and pressure. It has also been used successfully with children to stop a tantrum, before a speech or job interview. Directions: Bring spray nozzle up to mouth and apply 2 sprays on the tongue. Safety Information: Keep out of reach of children. If pregnant or breast-feeding consult your healthcare practitioner before use. Store below 77ºF. Ingredients: Active Ingredients: HPUS 5x dilution of Helianthemum nummularium, Clematis vitalba, Impatiens glandulifera, Prunus cerasifera, Ornitholgalum umbellatum. Inactive Ingredients: 27% alcohol.